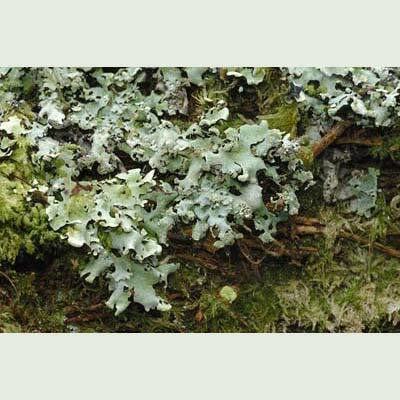 A very distinctive large foliose lichen of nutrient-impoverished tree bark and mossy rocks, H. endochlora has grey-yellow lobes and a yellow to lime-green medulla. It is usually a feature of oak-birch woods exposed to heavy leaching. The lobe-ends are untidy in their production of soredia compared with H. laevigata in which the soralia are always neat and usually globose. In Ireland, Counties Kerry, Cork, Galway and Donegal. Simms, M. J., (2016). Hypotrachyna endochlora (Leight.) Hale. [In] LichenIreland.